Planet Changer has an incredible opportunity with a matching grant to help make twice the impact! All donations through November 29, 2017 will be matched, up to $5,000 for a grand total of $10,000! When you partner with us financially, you are helping to combat poverty and inspire hope. You are supporting family preservation as well as orphan prevention and trafficking prevention. You are helping the communities we work with directly to make lasting change, allowing them to thrive. You are helping to save lives. We need your help to ensure we receive these critical funds. Every donation received will be matched dollar for dollar, so every donation (no matter what size) truly does make a difference. Thank you for your support and partnership! We could not do this without you. These are some of the faces that directly benefit from your generosity. Join us to change their reality. Decrease mortality rates while increasing health, education, and opportunity. Thank you! Planet Changer is very excited to announce a new partnership with a grassroots movement to inspire hope in villages near Siem Reap, Cambodia! While our work will continue in Uganda, it has always been Planet Changer’s goal to grow, and inspire hope, when carefully evaluated opportunities that fit our model arise. Cambodia was on the initial prospective list of countries mentioned in Planet Changer’s very first Vision Meeting, nearly seven years ago and before incorporation. With this new partnership, Planet Changer will help empower villagers to improve their lives and support them in creating lasting change. By partnering in this way, we will be actively engaging in the prevention of human trafficking, promoting family preservation by keeping families together, increasing literacy and education, and eventually offering trade education and business opportunities for villagers. “In January 2017, two friends (one Khmer, one American) sat down in Siem Reap, Cambodia to share dreams with each other. As it turned out, they had the exact same one: they wanted to build libraries for kids in villages. With the Khmer friend’s knowledge, research, and hard work, and the American friend’s connection to people in the States who wanted to help financially, the first Bamboo Library was opened in June 2017. Libraries #2, #3, and #4 quickly followed in the next few months. The American Friend, and Khmer friend, standing with the Village Chief (in green) where Library 4 is located. We are honored to partner with the team in Cambodia as they continue to invest in the villages to inspire hope and empower the people to thrive. Learn more about the Bamboo Libraries, and how you can get involved or how to follow along, here. Thank you for your continued enthusiasm and support! We appreciate you! These are my new friends. In order of their pictures – William, Patience, Jean Luke, Alex in his purple school uniform, Makaledo carrying a large bag of flour on her head, Solomon, Andrew, Oli giving me a “bonga” (fist bump), and finally, Mike and Elisha who desperately wanted to know what my strange skin felt like. These children, and the hundreds of others I have met in the rural farming communities of Uganda, have stolen a large piece of my heart. It is easy to forget the reason that we are here while my attention is on them… These kids, and thousands of others, have no other option but to use the unprotected water springs (in the second to last picture) to drink, cook with, and bathe in. Water constantly pours out from the earth but has no other option than to pool up in the dirt where bacteria and parasites breed and dangerous animals come to drink. Seeing this reality firsthand has made all other things in my life seem strangely dim. We at Planet Changer, in response to the earthquake devastation in Nepal, are standing with them and are committed to bring emergency aid in response to this disaster. Central Nepal (the Kathmandu Valley) is the worst hit as hundreds of thousands of people have been affected by the 7.8 quake. The death-toll, which is already at 8400 and climbing, is expected to eclipse 10,000. As buildings and villages have been reduced to rubble, the need for emergency food, water, shelter and medical attention is overwhelming to say the least. With such sever devastation, rescue/emergency teams are working round the clock to bring in aid. It is already estimated that 1,000,000 children are in areas that have been affected. We are partnering with two organizations that are on the ground delivering emergency help in the areas of food, water, clothing, shelter and medical care. Through partnering with World Vision and Doctors Without Borders, the Nepalese families will receive emergency and sustainable care from these two organizations that are experts in disaster relief. The devastation in Nepal is not a quick fix or a short-term problem but will need ongoing help rebuilding, therefore it is our aim to keep working with partners on the ground to help rebuild, revitalize and renew the region. Thank you for donating to Planet Changer to make a difference in Nepal. 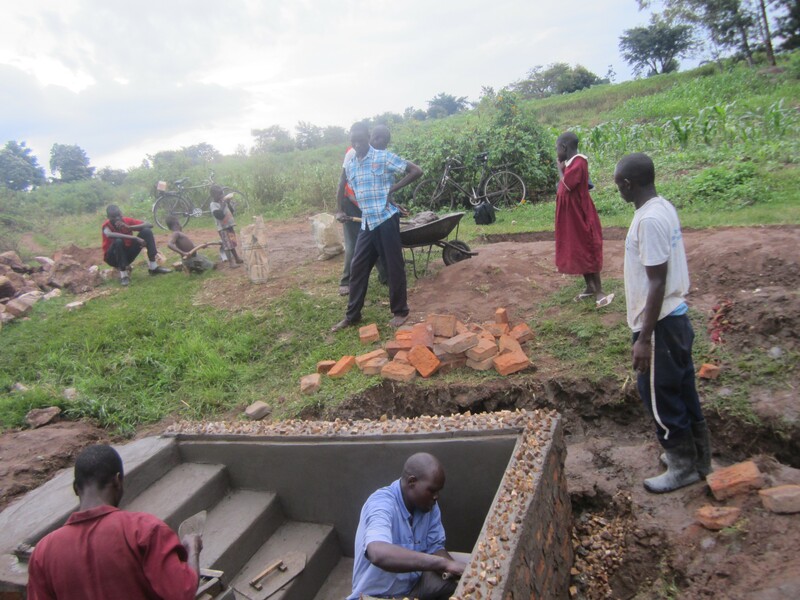 Planet Changer has done and is continuing to do a phenomenal and amazing work of protecting community water wells, in various communities in Uganda. These projects are enabling hundreds and thousands of residents, to get clean water for the first time in their lives, making them to overcome water borne diseases and saving them from spending many hours scooping water from unprotected well. This is enabling them to get more time for agriculture and for caring for their families , as with piped water, a bucket or jerrycan, which most residents use to collect water, is filled in a minute or less. 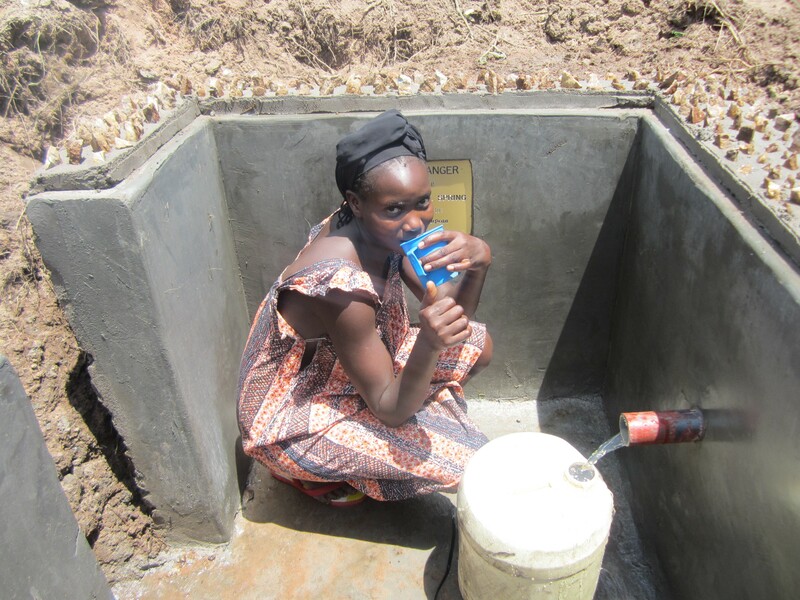 This picture shows a woman in Kajarau central, Mukuju Sub County, Tororo district, Eastern Uganda, fetching dirty water from unprotected spring, Kajarau Central Spring, before Planet Changer protected it. 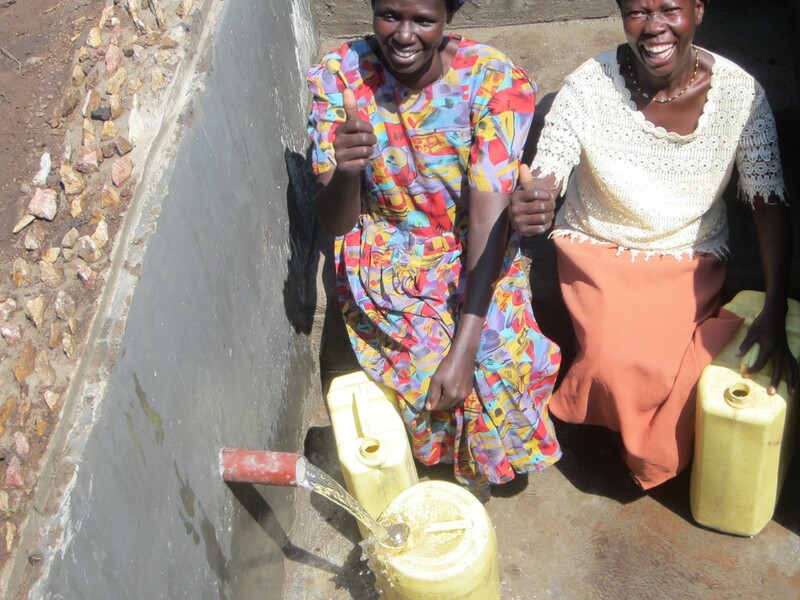 While the two pictures below, shows women in the same community fetching clean water from the now Planet Changer protected Kajarau central spring, expressing joy for getting clean water for the first time in their lives. The process of identifying community wells that needs protection, is done by me, Planet Changer’s project coordinator in collaboration with community leaders, water technocrats, and some health staff, to ascertain the viability of the said spring(s). It is important to note that, not all community springs are viable for protection, on our visits, we do assessment, to determine whether the visited spring is viable for protection or not,. At the spring, we ask the community residents to tell us the history of that spring, whether it has history of some times drying especially during dry season or not,. We then assess its water flow and its original ground water sources,. When we are satisfied that the spring ground water source(s) which is/are viable, which is visible through its water flow, and pressure coming from underground, and that it doesn’t dry, we approve it for protection. This is then followed with I tasking the community chairperson, to mobilize the community residents, to turn up in large numbers, and clear the way, where vehicles bringing in materials to the site will pass, community residents always turns up in large numbers for this task. Owners of gardens, that leads the way to the springs, always agree, to have their crops, temporarily destroyed, when clearing the way and do replanting of their crops after the vehicles have brought all the materials to the site. After that, the next task, is bringing in materials to the site. Always, I always bring in hard cores first (big rocky stones) to the site, we buy these hard cores from Osukuru hills, and near Kenyan boarder. These places are the closest source yet very far from grass root communities, where Planet Changer does spring protection, and these raises transportation costs to the spring sites. 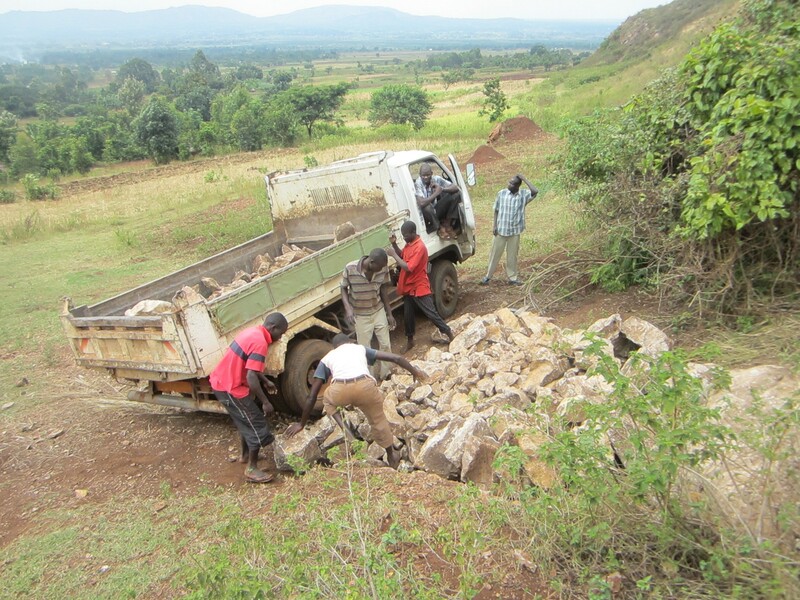 The picture below shows some community members loading hard cores in a Tipa lorry in Osukuru hills, to be taken to the site. Below, the first trip of hard cores, arrives at the site, and lorry goes back for more other trips. 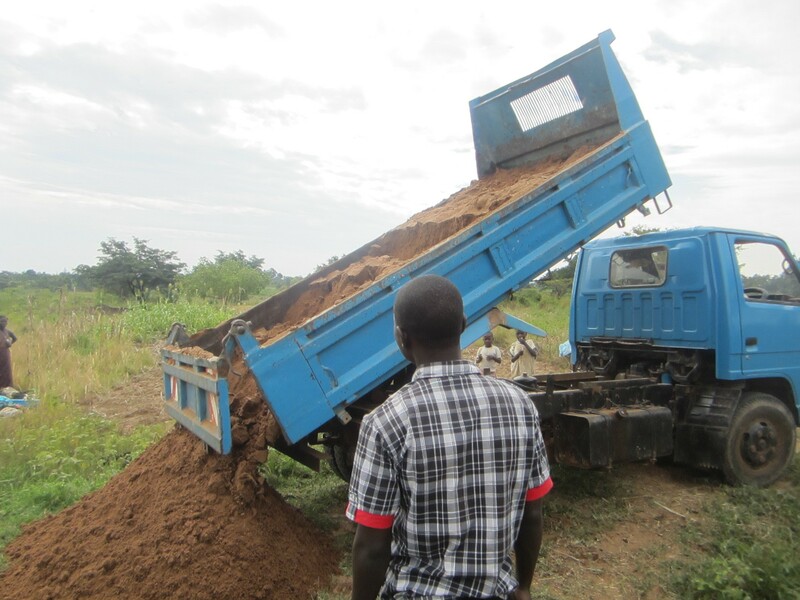 That is followed with buying of river sand that we get from Malaba, swamp, at the Uganda- Kenya boarder. And then plastering sand. 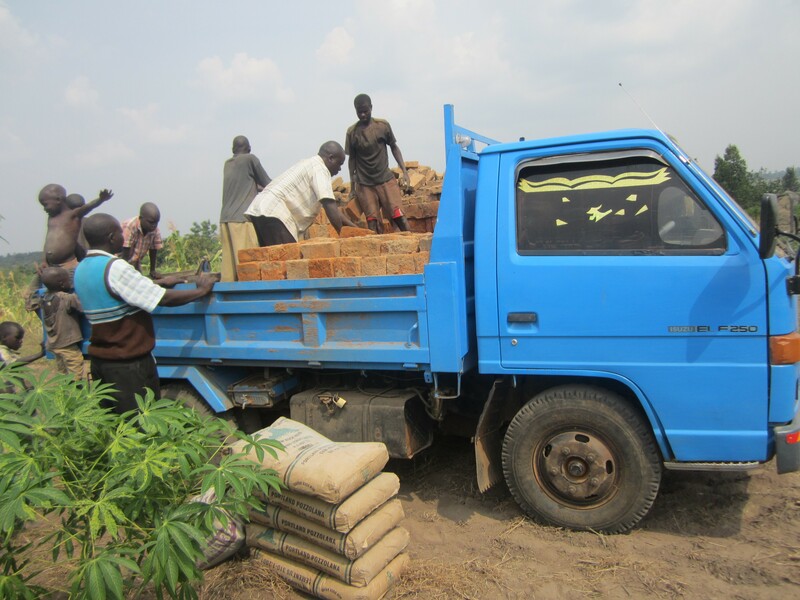 We then go and purchase bricks from owners. We don’t simply buy any bricks available, we always buy good quality bricks only. 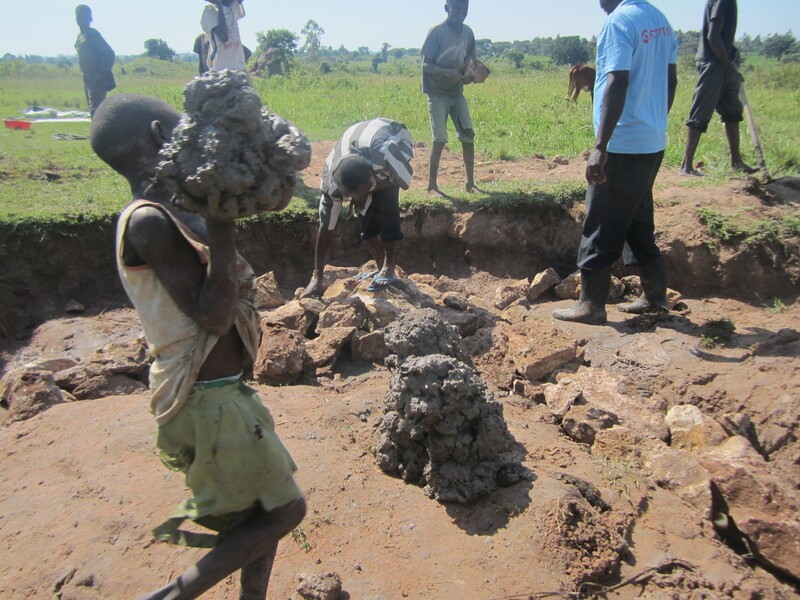 This at times, makes us to move around communities looking for good quality bricks, which luckily we always get. That is followed with purchasing of cement, metallic and plastic water pipes and other materials. When we are done with purchasing of all the materials required, the community chairperson is informed and calls for a community meeting, where community members are informed to get ready for next day to clear the site to pave way for construction work to begin. The following day, the community members, turns up in large numbers, with hoes, pangas, slashers, hard stone breakers and other tools and begin clearing the site. 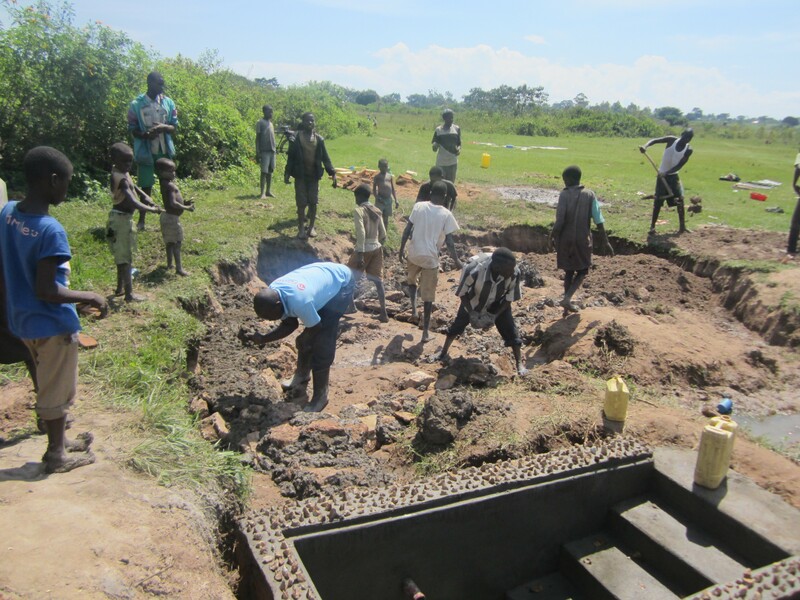 Under the direction of project coordinator, masons, and some technical staff, the community is directed how to divert water by digging (creating) water diversion channel and leave a water free area, where people will be drawing water from, as construction is going on. When the diversion channel is done, they are directed to work on creating a good drainage channel, where water from the pipe falls on concrete slab and then move through and in case there is a near by swamp area, drain through that swamp, and where there is no swamp area, drains up to a very long distance and disappear underground or gets collected at certain point and with time expand and develop into a large pond, water from this/these pond(s) is used by animals especially, pigs, goats, and cows, for drinking. The community involvement also extends to being helpers to the masons and looking for clay that is used for channeling and making the water not to sneak outside the pipe, the clay is also used for covering the hard cores from the soil used back filling the hole of a protected site to level. Community members ferrying the clay to the site. 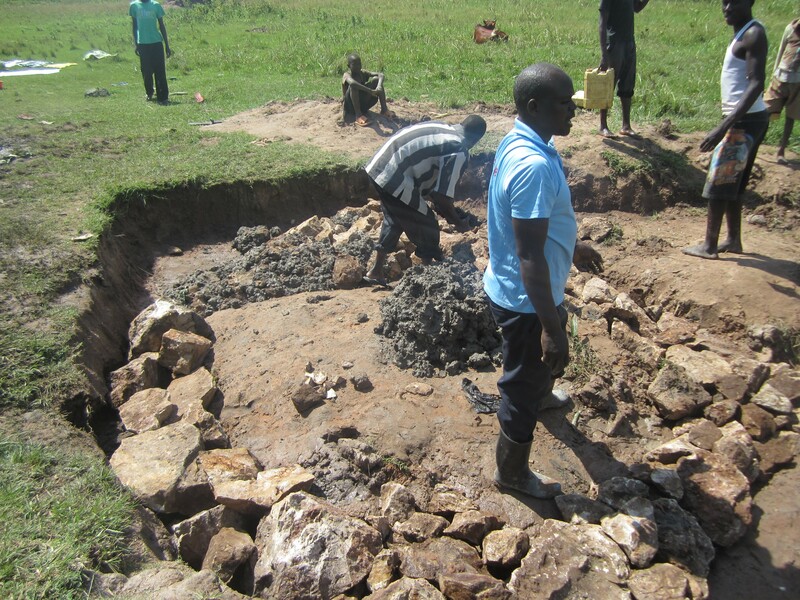 When the community members are done with, with the clearing of site, and creating water diversion and drainage channels, some members are directed to mix river sand and cement and then after mixing, put aggregates (small rock stones) and put water and then again mix, this time with aggregates inclusive, the mixture is then put on a wheel barrow and ferried to the exact location where residents will be drawing water from, from a protected source. It is then poured on the ground, and further worked on by the masons, to make a ground concrete cover slab. This is done in the morning, and it is then left the whole day to dry and in the next day, the masons moves in, and embarks on the construction process. When the construction is done, the structure is left to dry for 72 hours, and some times, it may take slightly more than that. Construction work is complete and it is now drying. The purpose of the rock pieces around the boarder of the walls, you are seeing in the picture, is to prevent people from sitting and put their water containers on it, this makes it to remain very firm and lasts for very very many years. What then follows is water channeling process that begins with careful piling of clay and hard cores on the pipe area, we cover the pipe below and above areas making sure water moving in between hard cores from the spring water source/s will directly flow through the pipe. There after wards, attention is turned to the spring ground water source(s) (spring eyes); hard cores are then brought in and carefully used to cover these spring water source(s), ensuring that they are not blocked. We do these by surrounding these source(s) with hard cores both sides and place others on top, and medium sized hard cores in the middle, up to a point where water flows directly through the pipe, in a shade like format. We then use clay, to cover small spaces in between hard cores, at this point in time, we block water diversion channel and make it, to now move in between hard cores, as it moves between hard cores, it is filtered by the sand and soil, and by the time, it flows through the pipe, it is now very clean and free of germs. When clean water flows through the pipe, we then, go on and cover a very big place, with hard cores, followed with, covering these hard cores with clay sand and other soils and level the entire place well, storm waters and animals cannot now in any way negatively affect the spring and people cannot wash their legs in it, since it is now fully protected, and people now draw clean protected water flowing through the pipe. Masons covering spaces in between hard cores with clay, before sand and other soil, is powered on top. This is done to make the water from spring source(s) freely move in between hard cores without any blockage. There after, sand and other soils is poured on the top. Clean water is now free flowing through the pipe. Community residents with much joy and excitement begins having a taste and fetching clean water for the first time in their lives. After fully completing the spring, a village committee comprising of eight people are chosen, by their fellow residents, to be responsible for general good of the well, like the periodical cleaning of the drainage channel and surrounding areas, which the entire community participates in. During this time, the residents are also taught how best to make their spring/s stay in very good conditions, like how to practice sustainable farming, in areas surrounding the spring(s), and told never to settle too close or build toilets, in these surrounding areas. We also during this time, do community hygiene and sanitation workshop, where we educate and urge residents, to, always wash hands before collecting and carrying the water, regularly clean water containers where water is stored in the house, clean all the cups that are used for drinking, never to store water in containers that have been used for pesticides or toxic chemicals, among others. 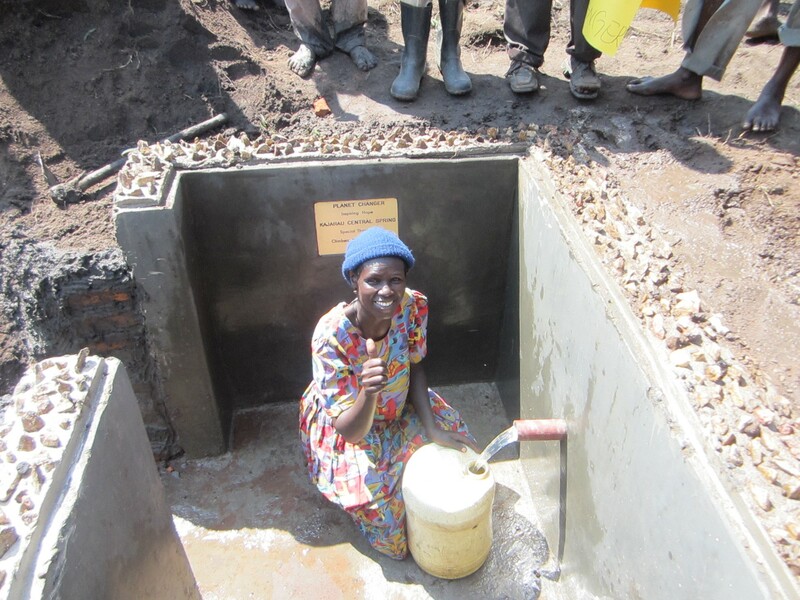 Then the following day, the projects coordinator hands over the spring to the community, that is followed with residents celebrating having clean water for the first time in their lives. Planet changer projects coordinator receiving a certificate of appreciation on behalf of Planet changer, from joyful area residents of Kasaya East village, in appreciation of an incredible work, planet changer did in their community of protecting their water spring, Kasaya East spring, they now have clean water. Water is life, people, animals, and plants need water to live and to grow, in most parts of Africa, Uganda inclusive, accessing clean water, is a mirage. Grass root people live in extremely poor conditions depending on dirty water from unprotected springs, that they share with animals, as thus, they are always suffering from water diseases, that put their lives in danger. By protecting their springs, and in the process making them get clean water free of germs, Planet Changer is doing a life transformational work, that is sustainably contributing to improving of health lives of grass root people. for centuries and decades, we have been depending on dirty water from unprotected spring, which have always made us suffer from water borne diseases like malaria, dysentery, and many others, with incredible work you have done in our community of protecting our spring, Mukuju central spring, this is no more, we now have clean water, we are indeed very happy for the help PLANET CHANGER, has accorded to us”. – Owino Dismas, the chairperson, Mukuju central. Moses Hategeka is Planet Changer’s Project Coordinator in Uganda, and is an independent governance researcher, farmer, public affairs analyst, and writer. Planet Changer is determined to eradicate hunger, and we are committed to sustainability in all of our projects. This commitment is why we are focusing on water on World Food Day. It is not possible to create sustainable hunger solutions without water. Without water, families are unable to irrigate their crops or care for livestock. Due to contaminated water, they may be too ill to tend to farming duties. Water changes everything. The gift of water is the gift of life. Health is restored, and communities are empowered to create long lasting food plans. We invite you to invest in our clean water projects as a first step in ensuring communities have a stable food supply. 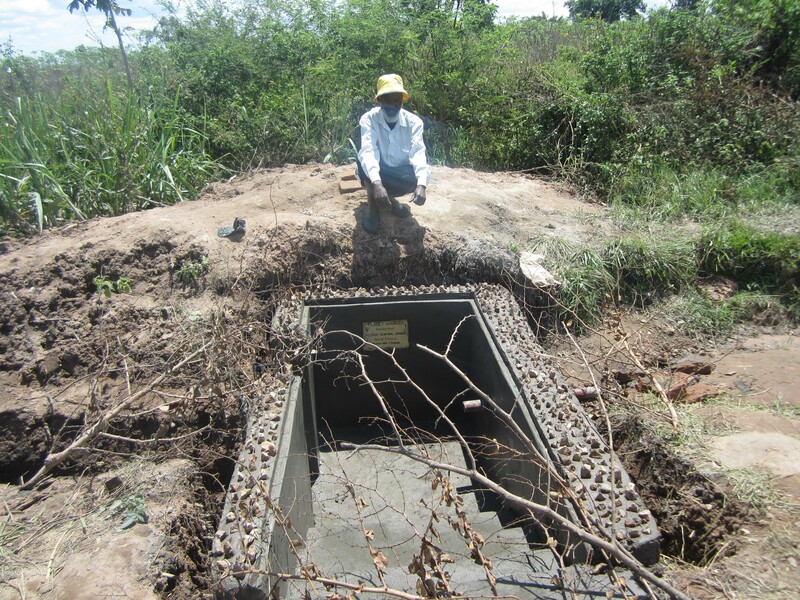 We are protecting springs in Eastern Uganda. Planet Changer is partnering with Not For Sale to bring you the I Am Not For Sale Tour: Working to end slavery. Join us for an evening of live entertainment and activism through music and a multimedia presentation. This Concert is FREE to the public and an inspiring call to action for all who attend. Invite your friends! Join us, rock out, and connect with NFS representatives who will explain how YOU can make an impact on the modern-day abolitionist movement. Sunday, September 23 2012. 6:00pm, held at Snoqualmie Valley Alliance. The Wrecking, a New England Rock Band, is headlining. Ithaca, a local favorite, is opening. 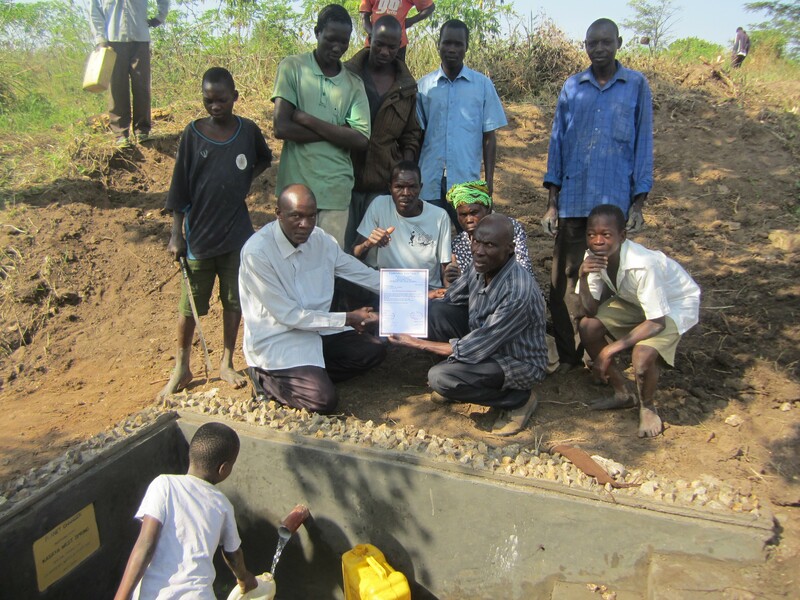 Planet Changer has been asked by local residents in Eastern Uganda to protect springs, beginning with the Tororo District. This will bring clean water to communities for the first time. Over 40 springs are currently identified. Only local labor is used during the protection of the spring, and each community is required to be involved with labor and providing locally available materials (sand, stones, etc). Surveys show that community involvement drastically improves the long term success of the project. The cost to protect each spring ranges from $650-$950 depending on the size of the spring (some springs are large and serve the needs of over 800 people). Each spring protection project offers a sustainable solution for clean water and includes hygiene and sanitation workshops for the community, water testing at the completion of each project, and regular inspections to ensure the integrity of the protected spring. “Protecting water springs for families in Eastern Uganda, will enable them to begin accessing clean water and thus help them in overcoming various water borne diseases such as malaria, bilharzia, dysentery, among others, which they are currently suffering and which has on several occasions led to death of many people majority being children, as a result of them using dirty water drawn from unprotected community springs which is unfit for human consumption. Protecting water springs for families in Eastern Uganda, will enable the families to begin accessing clean water within the vicinity of communities where they stay, this is not the case today, as many hundreds of communities lack clean water and therefore have to walk for a distance of over 7 miles if they are to get some how clean water in towns. 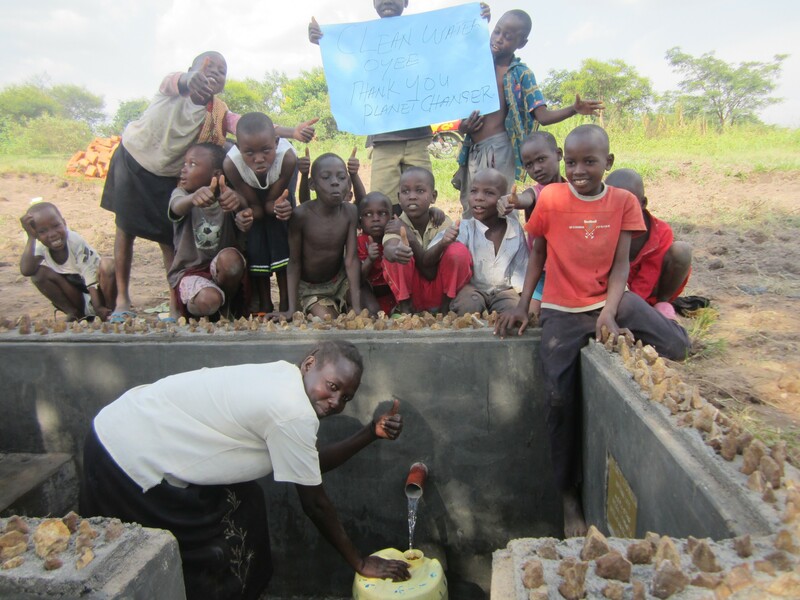 Planet Changer invites you to invest in our clean water projects in Uganda. People/families/groups donating $500 or more will receive recognition as special thanks on the completed project. Donors of $100 or more will receive pictures of the completed project, and a copy of the letter of thanks from the receiving community. 100% of all public donations will go to the project or fund that the donor designates (minus transaction cost, if applicable). 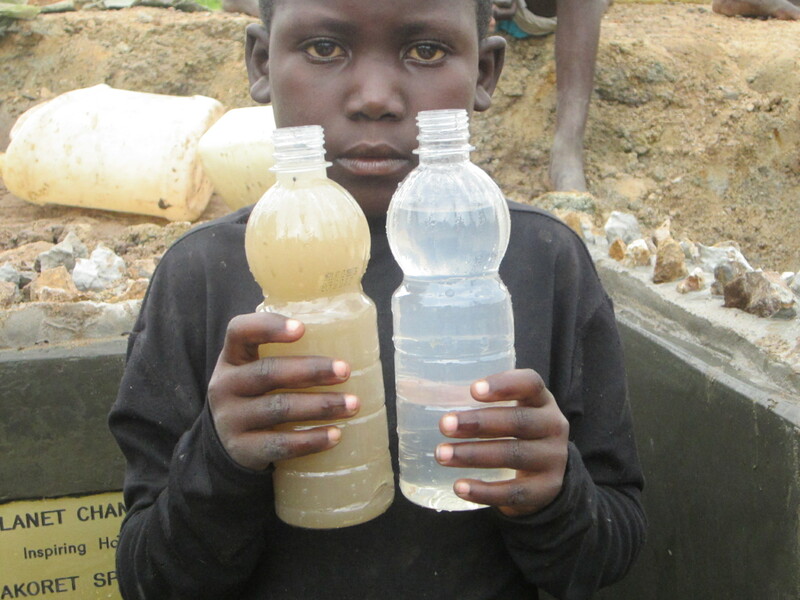 Donate to protect springs in Uganda now. In March Planet Changer purchased organic vegetable seedlings that were distributed to multiple small-holder farms. These seedlings were an improved variety that can better withstand drought and insects. Spring is the most favorable season in Uganda for planting vegetables. These seedlings have thus far been highly successful. The plants are growing and producing well. The lives of the farmers have already begun to improve. Join Planet Changer in empowering Ugandan Farmers to create sustainable food sources for their families and surrounding communities. $1000 will complete our effort to provide all of the farmers we are currently working with a first round of seedlings. This is one of the communities that will receive seedlings. Join us in empowering these families to feed their children and implement sustainable hunger solutions for their community. See additional pictures here. African economies are agricultural based, with majority of its people engaged in agriculture both for basic and food sustenance, living in rural areas. Millions of grass root farmers in this continent live in hard to reach areas, where infrastructural facilities such as good roads, clean water, health facilities and power, are absent. I have been to various African countries and am on compassionate ground, always working with grass root farmers deep down in their localities, teaching them application of agricultural best practices and agribusiness skills, I have observed and noted that, one common problem/challenge that these grass root farmers are faced with, is that, they have totally been left behind in adoption of new agricultural technologies and usage of evolving methods of increasing production. They still use traditional tools such as hand hoes, pangas, etc., which cannot and are not enabling them, to properly till their lands on a much bigger scale they would have wished to like in case they had tractors. Millions and thousands of these grass root farmers lack knowledge and skills in proper land preparation techniques, how to properly store seeds for planting in the next season, how to properly plant crops, how to improve fertility of their lands, how to control soil erosion and how to control pests and diseases, which is making it so hard, for them to produce enough food they wish to, for their proper survival. In many communities, farmers still largely traditionally practice growing of one type of crop like maize, cassava, bananas, sweet potatoes, etc., year in and out and this has contributed and is contributing to loss of fertility of their lands, which in turn, is resulting into low crop yields and because of this, many farmers are increasingly find it hard to sustainably feed their families. In fact, many of the households, survives on one meal a day and only takes plain porridge and in some cases water, as their supper before going to sleep. Sleeping hungry is very common in many of these farmers’ homesteads. Their children are malnourished because of lack of balance diet and this is severely stunting their normal growth. 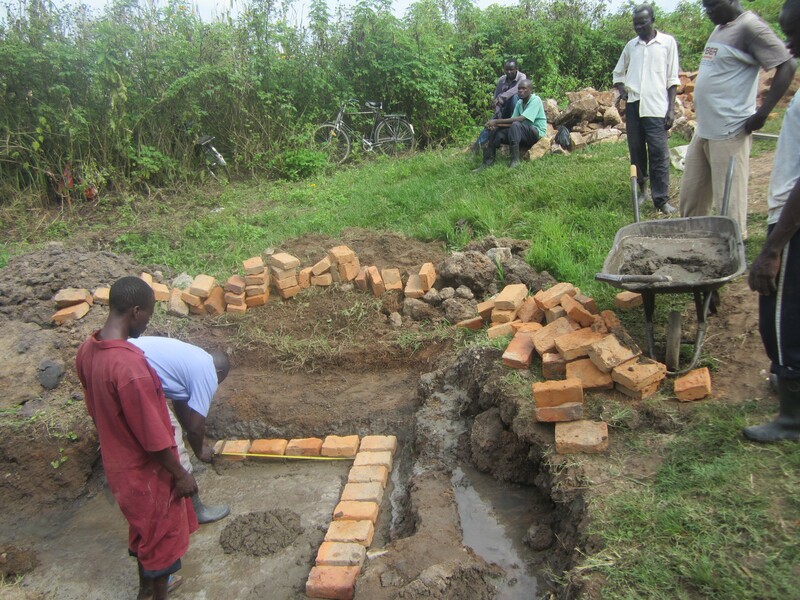 All these problems/challenges, can greatly be overcome, by establishing a well/fully built demonstration/teaching farm/s in grass root farmers’ areas and in this case in Uganda, which is a country found in East African region that is comprised of five countries, namely, Uganda, Kenya, Tanzania, Rwanda, and Burundi. When the demonstration/teaching farm/s, is/are established, grass root farmers’ groups, from various parts of the country and in the region, will always be hosted and practically be trained, in the application of appropriate agricultural technology and in the application of suitable practices as evidenced from the teaching farm. They will then be routinely followed up and guided by the skilled team from the teaching farm, on how best to apply the knowledge and skills gained from these trainings. The establishment of a fully established teaching farm including the purchase of the land (120 hectares of land) where the farm is to be established, hiring of two tractors, purchase of various irrigation tools, fertilizer application, labor, professional fee, purchase of various seeds and seedlings, pests and disease control as well as routine farm management and maintenance will cost approximately, $120,000 (US DOLLARS). In sum, grass root farmers in Uganda and Africa at large, are always eager and wiling to learn when given an opportunity. The establishment of a teaching farm(s) targeting to benefit them will be a blessing to them and will sustainably transform their lives in regard to overcoming hunger and poverty in their homes. MOSES HATEGEKA, is a practicing farmer with a mission compassionate of where resources allows, to always help grass root farmers in Africa, to adopt new agricultural technologies and usage of evolving methods of increasing production. He is also a Ugandan based independent governance researcher, public affairs analyst and writer. 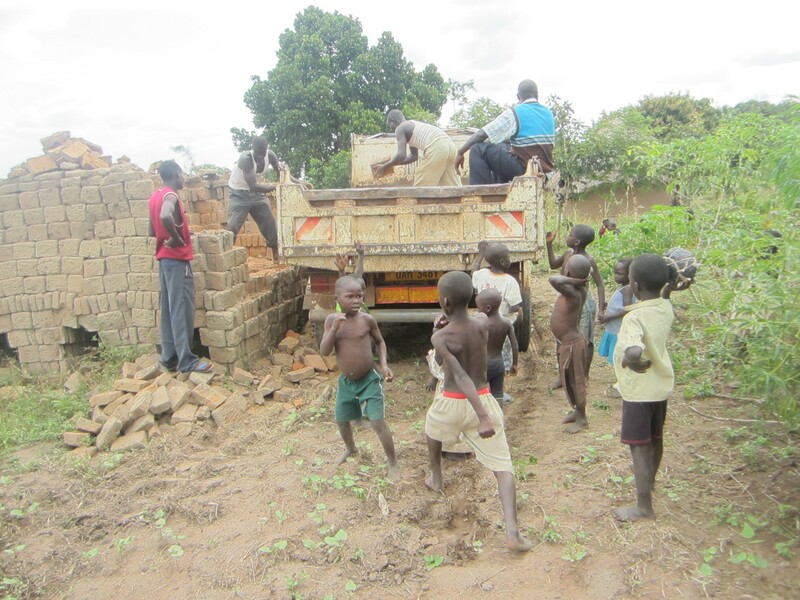 Millions and tens of thousands of grass root farmers’ families in Uganda and Africa at large, are living below poverty line, surviving on less than one dollar ($1) a day and are trapped in chronic poverty circle, with many of them possessing very little hope of to one day be better. Many of their children are malnourished and suffering from various forms of diseases like kwashakor, persistent fever, memory lapses, etc., as they are not able to feed on balanced diet, which their bodies needs to function properly. Majority of grass root farmers cannot afford decent accommodation later alone to properly educate their children. These people thus needs special programs from people/organizations of good will, if they are, to be helped move a way from hunger and poverty predicament situations they are living in. one of such programs, should be an establishment of dairy goat breeding center. In Uganda and Africa at large as well as globally, the demand for goats’ milk is skyrocketing on daily basis because of its nutritious values, proven scientific evidence, also states that, goat’s milk contains more nutrients a human body craves for and that it is more healthier to human body than a cow’s milk. Because of this, goat rearing is now one of the most profitable livestock farming initiative, which I also believe that, if introduced to grass root farmers in Uganda, will positively transform their lives. When a goat dairy breeding center is established here in Uganda, it will be a goat rearing training center, where grass root farmers from various parts of the country, will always come in and be trained in goat rearing techniques including, feeding, healthcare, breeding, housing, milk storage as well as marketing techniques. Many of these grass root farmers are only used to traditional goats and have not in their lives seen goat breeds such as, Saanen, Alpine goats, Toggenburg, Nubian goats, etc. they will thus need to be trained in these mentioned goat rearing techniques. With this program in place, farmers will be able to get enough milk for their families thus contributing greatly to meeting the nutritional needs of their homesteads, and will also be able to get revenue from the sale of surplus milk which in turn will enable them, to buy books and school uniforms and send their children to school, which currently they are failing to do. They will also be tought how to save and with these small savings, they will be trained and encouraged to invest more in goat rearing business, this time now buying breeds from the center, so as to make the breeding center and their goat business sustainable. This in addition to transforming their lives will also give farmers, a sense of dignity and pride in their communities. In sum, establishing a goat breeding center here in Uganda, will not only transform Uganda’s grass root farmers lives, but will also be a goat rearing training and research center for other grass root farmers in East African region with interest in goat rearing as well. Many farmers in Uganda and in East African region I have and always interacting with, are eager and willing to fully engage in this program. Planet Changer is excited to announce our newest project to eradicate hunger – establishing a dairy goat breeding program in Uganda! Many Ugandan families live on less than $1 a day. Raising and caring for dairy goats brings immediate and positive change to these families. The level of nutrition in their home increases significantly. Surplus milk can be sold at market, a high demand for goat milk already exists. A revenue stream is created allowing farmers to send their children to school and improve their farming techniques to increase their yields. This impacts entire communities as they are empowered to begin to raise themselves out of abject poverty. To ensure program sustainability, Planet Changer is securing land to establish a goat breeding and training center. 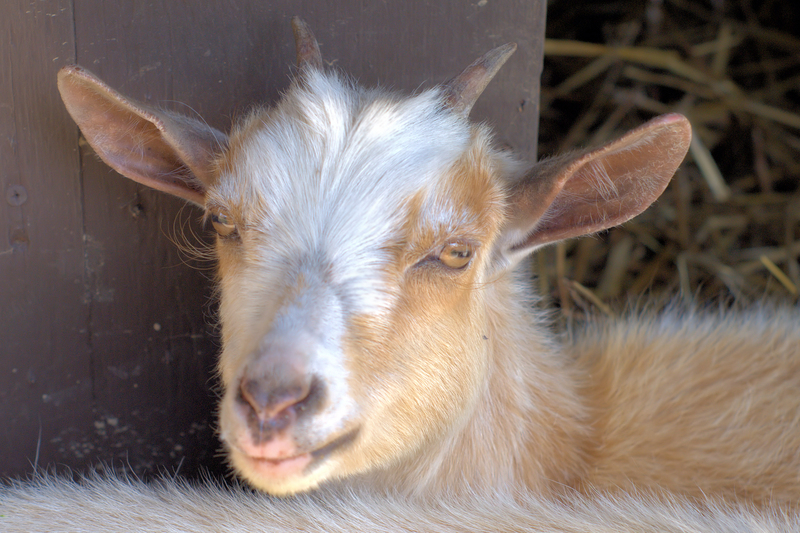 Farmers will receive training in how to properly care for the dairy goats by a local goat breeding specialist. Upon completion of training and proper preparation to care for the goats, the farmers will receive a goat. When the goat reaches maturity the goat will be bred and the offspring will be given to another farmer who attends training. This goat will also be bred with its offspring given to a new family, and the cycle will continue. With this model, Planet Changer increases our breeding capabilities and farmers actively assist each other. Long term, this program will benefit thousands of grassroots farmers across hundreds of communities. The start up cost of the goat breeding program is $16,000. Planet Changer invites you to partner with us to to save lives in Uganda and help farmers create positive futures for their families and communities. A community tube well, often serves 6 to 10 families. Typically, this is the first time in their lives that these families have access to a deep well that provides clean water. The impact on their lives is dramatic. 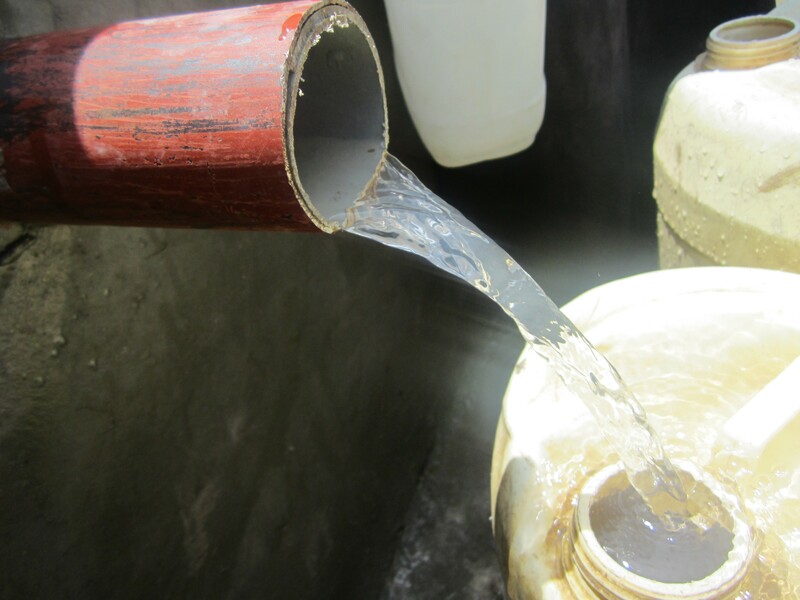 The clean water improves the health of the individuals in the community. Children who were collecting water all day long for their families can now go to school. Women are able to better care for their children and even contribute to the family’s income, rather than spend innumerable weekly hours carrying water. Local technicians have been trained in sound well-drilling practices. This ensures wells are constructed properly, are sealed (preventing contamination) and provide clean water from a deep source. In addition, selected community members receive system maintenance and repair training to ensure sustainability of the project. This fully funded project brought clean water to a remove village in Nepal. It included material cost, local labor for installation, and associated education programs to the village (sanitation, system maintenance and repair, etc.). $500 worth of Haitian handcrafted jewelry was sold at an event. 100% of the proceeds went directly to the 16 ladies who created the pieces and the program that provides their education, material, and work space. Supporting their livelihood allows the ladies to achieve financial stability and care for their families. Women in this program have literally been able to bring their children, who were living with extended family, home again to care for them. Cité Soleil is one of the poorest and most dangerous areas in the Western Hemisphere. It is one of the biggest slums in the Northern Hemisphere. It has virtually no sewers, electricity, stores, health care facilities or public schools. Families often do not have food for the day or money to purchase necessities. This fully funded project includes annual tuition and two meals a day for children in families who are otherwise unable to care for them. Without this assistance, these children are at risk of being given to another family as a restavek (child laborer) in the hope that they may be better fed and educated; or they may be given to an orphanage out of desperation. Haitians value education and that is especially true for those that live in places like Cité Soleil. Haitian parents want their children to attend school because they want a better life for them. They want them to be prepared to get a job and take advantage of any opportunity that arises. They do not want their children hindered by illiteracy and poverty as they are. These are their dreams for their children’s future. Planet Changer is helping parents to keep their children and realize these dreams. HELP SPREAD THE WORD ABOUT PLANET CHANGER! Recently approved as a 501(c)3 non-profit, we are excited about our inaugural year! We are passionate about changing the planet and empowering anyone, everywhere, to become a Planet Changer. We need your help to make that passion a reality and make our first year the best it can be. Is social media a part of your life? Do you blog? Are you on Twitter or Facebook? Perfect! We want to equip you to spread the word planet-wide. Help others become Planet Changers and join the movement to Eliminate Thirst, Eradicate Hunger, Abolish Human Trafficking, and Revolutionize Orphan Care. With the exciting projects we have underway and the wide range of options to take action as a Planet Changer, sharing what we are up to should be exciting and fun! Below are ideas on how to be a Planet Changer through social media. Please feel free to use the information as is or edit it to your preference. Please make sure you tag us by typing @ before Planet Changer (@PlanetChanger) in your status updates! Planet Changer is a recently approved 501(c)3 non-profit making positive and sustainable change planet-wide by eliminating thirst, eradicating hunger, abolishing human trafficking, and revolutionizing orphan care. Planet Changer engages in relationships, awareness, and teaching opportunities. Planet Changer advocates for people oppressed by lack of clean water, hunger, trafficking, and limited resources to care for their children. Planet Changer empowers people who need support, and people who are dedicated to aiding affected communities, to create lasting change. However you are wired, whatever you are enthusiastic about, Planet Changer is committed to connecting you to opportunities to make a difference. Whether it is advocacy, volunteering your time, spreading awareness through social media, donating to a specific project, in kind donations, or a willingness to listen to your ideas to get involved, Planet Changer offers something for everyone. Eliminate Thirst. Eradicate Hunger. Abolish Human Trafficking. Revolutionize Orphan Care. Change the Planet. Be a Planet Changer. To learn more about Planet Changer, visit www.planetchanger.org , like them on Facebook and follow them on Twitter. Planet Changer has entered into a strategic partnership with an incredible organization saving lives in Kenya by protecting natural springs to offer a clean water source for the nearby community. 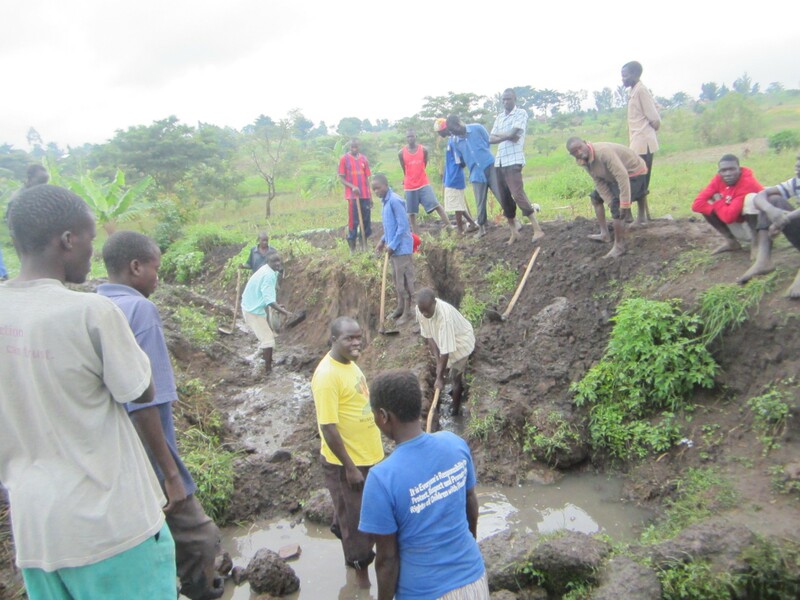 Springs are currently being protected in the Emuhaya and Kwisero Districts in the Western Province. A positive relationship has been established with the District Commissioners and District Officers. Over 350 unprotected springs have been identified; Planet Changer is helping our partner reach their commitment of protecting each spring within the next three years. 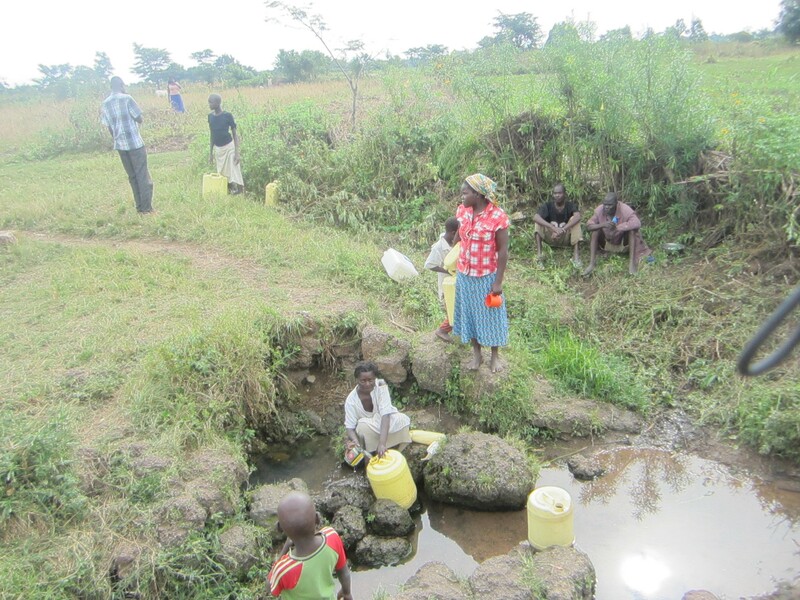 Each spring provides water for communities ranging from about 160 to 250 people. Many of the springs are located near schools, which means over 500 children could collect clean water from a protected spring. 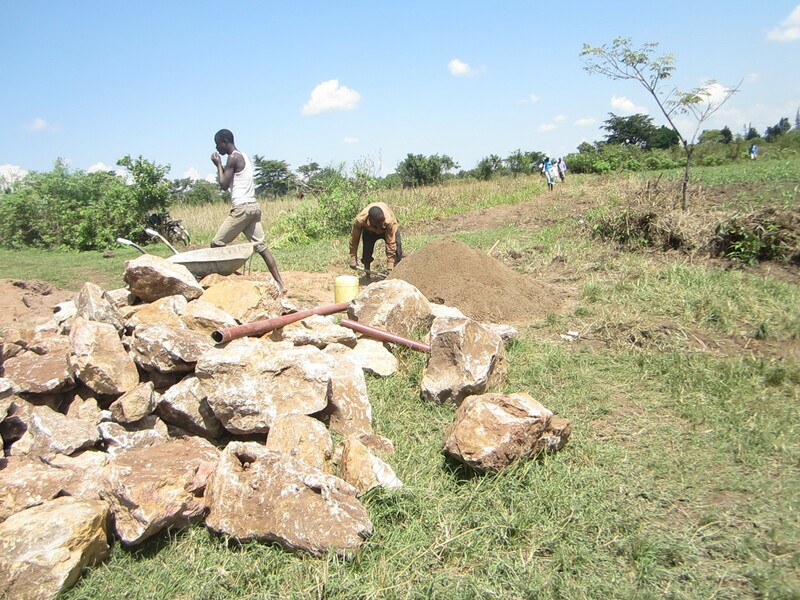 Only local labor is used during the protection of the spring, and each community is required to be involved with providing locally available materials (sand, stones, etc). 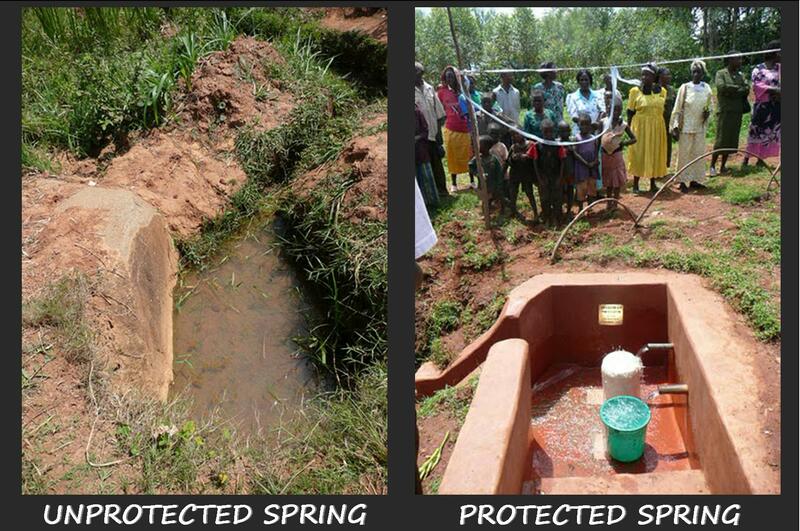 Each protected spring offers significant health improvements in the community (decrease in typhoid, water-borne disease, and malaria as mosquitos breeding grounds are eliminated), less firewood consumption and deforestation as there is no need to boil the water, and drownings of children collecting water are prevented. The cost to protect each spring is $500. 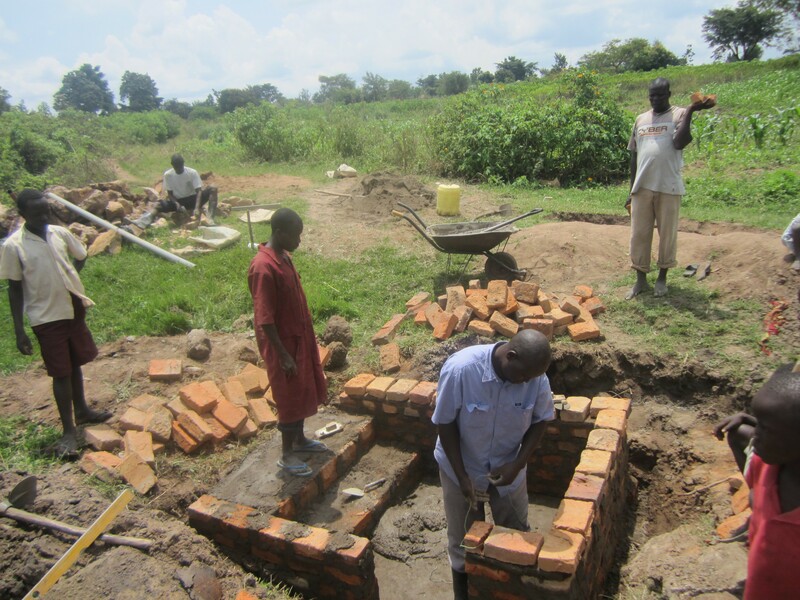 Each spring protection project offers a sustainable solution for clean water and includes hygiene and sanitation workshops for the community, water testing at the completion of each project, and annual inspections to ensure the integrity of the protected spring. 100% of all public donations will go to the project or fund that the donor designates (minus transaction cost, if applicable). Donate to protect springs in Kenya now. Planet Changer has established a Family Sponsorship Fund. We work closely with our partners in various countries to empower parents to provide for their children when they have reached the desperate place of considering giving up their children solely due to their inability to provide for the child’s basic needs. Needs are evaluated per family and situation; grants are given for school tuition, small business start-up costs, developing sustainable food security, trade classes, and more. This allows children to remain with their parents and not become legal orphans. Planet Changer is partnering with a cooperative of 1000 farmers in over 100 grass-roots communities to enhance their capacity to improve crop quality and quantity as well as increase their efficiency in accessing markets. Small-holder farming is the major economic activity for over 80% of the Ugandan population. Most of the farmers live in rural areas that are characterized by endemic poverty. First steps include providing improved seedling varieties and drip irrigation systems to increase produce and empower them to fight hunger in their communities. Improved fertilizer and a co-op shared tractor are included in future goals. Long term this project includes education in agribusiness; best practices to limit climate change complications, how to build community buffer stocks of surplus produce, and how to work together for sustainable solutions to eliminating hunger. Planet Changer is empowering this community to implement sustainable hunger solutions to provide for their children, themselves, their families, and their surrounding area. Will you join us? The Polaris Project is a USA based organization committed to combating human trafficking and modern-day slavery. They offer a national human trafficking hotline and a wide range of social services to survivors of human trafficking including emergency services, comprehensive case management, group therapy, transitional housing, and victim outreach. Christian Friis Bach, Danish Minister for Development, thinks fighting hunger is all about helping small farmers. We agree! Planet Changer is finalizing a partnership to work with over 1000 small farmers to help them create sustainable food solutions for 100 communities throughout Uganda.